Crystal Clear Pickups 1969 Inspired Mini Humbuckers. Mini Humbuckers have been a favorite with guitar players since the 60's. Our Mini Humbuckers are based of a classic Les Paul Custom set from the late 60's with slight alterations. Our mini humbuckers offer a less dramatic volume change between neck and bridge positions. 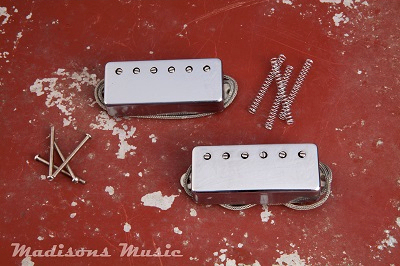 Our bridge pickups sound fuller and offers more punch than the originals. Our neck pickups offer a deep bass responce with a tone you would expect from a vintage inspired pickup!